The World Heritage Committee yesterday made a unanimous decision to maintain the World Heritage status of Tasmania’s forests. The Australian Government was an international embarrassment with it’s attempt to have 74,000 hectares of forest removed from the list, that had only been given World Heritage status at last year’s annual meeting. Portugal spoke at length to support the protection of the forests, and indicating the way in which a de-listing would undermine the integrity of World Heritage. “Accepting this de-listing today would be setting an unacceptable precedent impossible to deny in similar circumstances in the future. If this committee cares for conservation according to responsible engagement of state parties to the convention when they submit their nominations, we cannot accept these requests to de-list” said the spokesperson for the Portuguese delegation. Just as we did this time last year, everyone sat watching the online live feed from the World Heritage Committee. And I once again felt that flood of relief that came as the hammer went down to declare our forests still officially World Heritage listed. Thank you to everyone who took part in the Global Action to #DefendWorldHeritage in the lead up to this meeting. 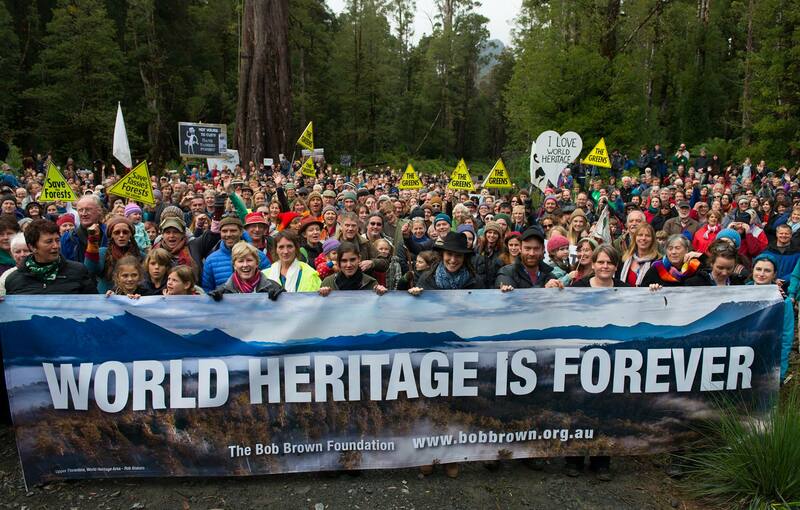 We had thousands of people around the world, across 16 countries, standing up for Tasmania’s forests. You can check out the slideshow of images by clicking HERE. Or take a look at the mosaic poster below, designed by Emma Capp of Still Wild Still Threatened. Zoom in and see if you can find your photo! This is a great success and I’m so proud to be a part of an international movement that has achieved such a fantastic outcome for our forests! Of course, we must not forget about what needs to be done next. There is still a long way to go to ensure that our forests have the real protection they deserve. And we need your help to keep the momentum going so that we can go from one success to another to another, until there’s is an end to the industrial scale destruction of our native forests. Check out and share my opinion piece on ABC Environment (CLICK HERE), outlining why the campaign is far from over and what we need to fight for now to ensure our forests survive into the future. Global Action to Defend World Heritage happening now! 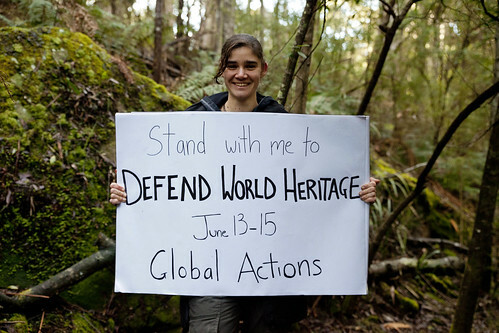 Hundreds of people all around the world are taking action this weekend to defend World Heritage. We’ve had over 250 actions so far, and more coming in all the time. Observer Tree and Still Wild Still Threatened are joining with the Bob Brown Foundation and the Australian Marine Conservation Society to bring together people around the world in strong global message of support for protecting Australia’s World Heritage sites. In just a few weeks the World Heritage Committee will decide the fate of two of Australia’s most iconic and significant environments; Tasmania’s forests and the Great Barrier Reef. Join with thousands of others from June 13-15th in our Global Action…. Now is the time to add your voice to the global call for the protection of Tasmania’s World Heritage Area. Check out the new online campaign launched today and share it far and wide! Join the campaign and send a message to the World Heritage Committee that people all around the globe want to see Tasmania’s forests stay protected forever. Check out this beautiful short film launched today, following my story of spending 449 days in the Observer Tree and my experiences at the Camp Florentine blockade. Thanks to Jeff Wirth for putting this film together – it’s what everyone who has followed Observer Tree has been waiting for! Hope you enjoy it and please share it far and wide. Let’s spread the word about the fight to defend Tasmania’s World Heritage forests, because the battle is far from over. Now is the time to get active and make sure our forests stay standing for the future. It’s hard to believe but the Australian government intends to open up Tasmania’s World Heritage forests to logging destruction. They have officially requested revocation of 74,000 hectares of World Heritage listed forests. Although the loggers previously claimed to support protection of these outstanding forests they are now eerily silent, waiting for the spoils. We need your help now to keep these forests safe. The industry must be told of the overwhelming revulsion of people everywhere if the chainsaws return, making their products unsaleable. Sign the online action to send a message to the whole chain of destruction from the loggers, through to the processors and the retailers – there is no market for World Heritage destruction. Being back out in the Upper Florentine Valley was full of mixed emotions. The incredible feeling of standing amongst ancient trees, knowing that they still stand only because we fought to defend them, knowing that right now they are internationally recognised and protected as World Heritage. Yet, the frustration at having to be here again, fighting once more, less than a year after the protection of these forests, to try to keep that World Heritage protection. The Australian Government applying to the World Heritage Committee to have 74,000 hectares of the newly listed forests removed from the listing and opened up once more for logging. It was with a deep sadness that I stood there amongst those trees knowing that after such a long battle to have them protected, that they may be just months away from potentially being under threat of logging once more. But I felt something incredible standing out there too, because I was standing there with almost 2000 others, all committed to defending those forests. And I felt a spark within me, an inspiration, a knowledge of what is possible. The power that we have when we stand together. As I walked up the Gordon River Road, people bustling about everywhere, it reminded me of a feeling I’ve had right there on that road before. It reminded me of all the times that people have come out to support the blockade and stood together to make sure those trees stay standing. And I wish we didn’t have to do it again, but I know that if we have to, we can. Yes, we stopped them logging the Upper Florentine and we can do it again. I felt privileged to stand up before those 2000 people to share my thoughts. Before getting up to speak, I was feeling nervous – as I always do before having to talk! I went into the forest, to sit with the stump of a tree, that was once a mighty giant, known as Lungs of the Land. It was an ancient eucalypt that used to house a tree sit nestled high in its branches, and stood directly in the way of Forestry Tasmania’s planned road. I spent a lot of time up in that tree sit. And I was planning to start my speech with a story about it. I sat with that tree stump and all those memories came flooding back to me. The many nights climbing up ropes into the darkness, the stars twinkling above, the dark silhouettes of sassafras leaves swaying gently in the breeze… climbing up and up and up… into the upper canopy, a whole different world to the forest below. And those memories of sitting in that tree sit and watching as the forest around me was smashed, as the road was pushed around the tree sits. Watching 400 year old trees fall to the sound of chainsaws, my tree shaking as they hit the ground. Sitting there, with that stump, letting those memories wash over me, I felt a certain strength within me. Just beyond me, on the road, I could hear the sound of 2000 people gathering to defend this forest. And below me, the stump of a tree that will always remind me of how hard we fought for this place. It will always remind me of how much we will continue to fight, how we will never give up on these forests. When I stepped out of the forest and up onto the stage, and looked out across the crowd, that feeling only amplified. Thank you to everyone who came along to the rally, and to all of those who could not make it but were there with us in spirit. Together we will ensure these forests remain standing. And this is just the beginning. Please watch and share the video, tell your friends about this important fight to protect our World Heritage forests. And watch this space for more opportunities to get involved. Two years ago, I climbed into the upper canopy of Observer Tree and vowed to stay until the forest was protected. On that day, I had no idea what would lay ahead of me in what would become a 14 month long tree sit. To sit here and reflect on the past two years – I realise how much has changed for me in that time. The connection that I developed with that tree and the forest around it, the lessons I learnt, the challenges and inspiration. And so much has changed for the forest. This time two years ago, chainsaws were tearing apart the forest around me, as logging continued for the 3rd day in coupe TN044B. I sat there and listened to the sound of those saws and the trees falling and wondered if my presence there could ever save that forest. Two days latter, loggers came to the base of my tree and called out to say they were leaving. They packed up the machines, drove them away and never came back. That forest that would have been a clearfell by the end of that summer, is now still standing. I will never forget the day when the World Heritage committee announced their decision – the forest that I had come to know as much as I know myself, the tree that had become my closest companion – was now World Heritage listed. It’s safe from the chainsaws that once threatened it’s survival. But the fight is not over. We need to stay vigilant to ensure that the forest is protected, as the Australian Prime Minister talks of trying to over turn the World Heritage listing. We also need to keep on fighting for the native forests that are still being logged right now. 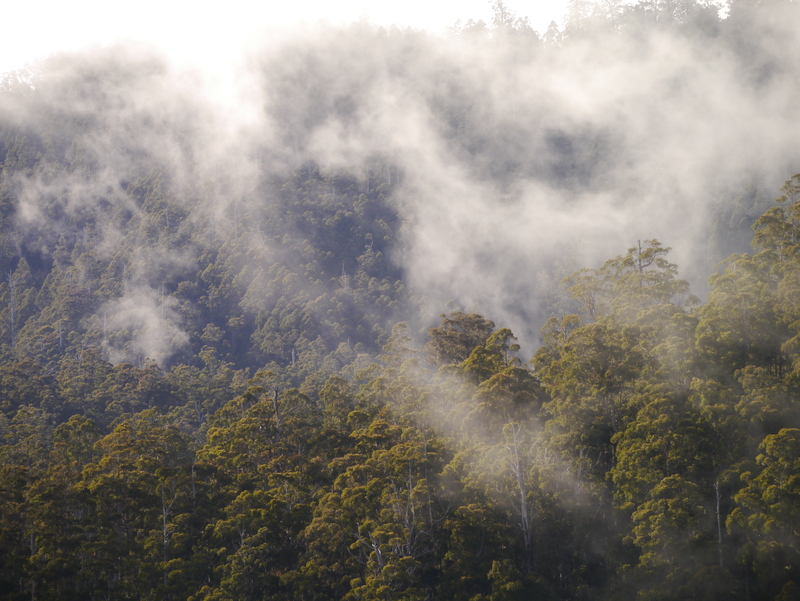 In Tasmania, high conservation value forests are still falling. The World Heritage decision is significant, but we always knew that this would not be enough to provide the conservation outcomes that are desperately needed to protect our ecosystems and our endangered species. Yesterday I made this short video to mark two years since climbing into the Observer Tree. I would love it if you would share this far and wide, and help to spread the word that the fight for our forests is continuing…. Two years since climbing Observer Tree from Observer Tree on Vimeo. Students and conservationists are today participating in a peaceful protest in Tasmania’s north east. 35 people have conducted a “walk-in” to a logging coupe in the Fisher Tier forests, halting the ongoing destruction of native forests in an area identified as high conservation value by the Independent Verification Group (IVG). 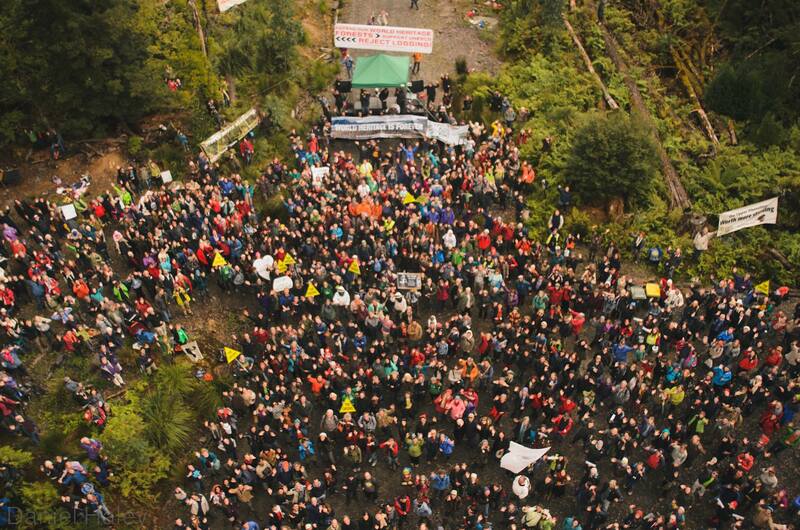 “Today’s protest highlights Australia-wide concern for Tasmania’s forests and the absence of social license for the Tasmanian forest industry that continues the destruction of native forests. Students from around the country are joining today with Tasmanian grassroots forest campaigners, to express their outrage at the hypocrisy of the Tasmanian Forest Agreement and the entrenchment of industrial scale native forest destruction,” said Ms Gibson. “This logging of proposed reserves reflects the business-as-usual logging schedule of Forestry Tasmania that is destroying tracts of Tasmania’s high conservation value forests,” Miranda Gibson said. “The Tasmanian Forest Agreement has failed our forests. No new reserves have yet been created and meanwhile special legislated exemptions allow 42 separate logging coupes to continue inside landscapes identified for future protection” Ms Gibson said. “These proposed reserves face ongoing logging, and their high conservation values are being destroyed by the native forest industry, which has been granted legislative permission and endorsement by some Environment groups to destroy ancient ecosystems.” Miranda Gibson said. “Hundreds of university students from around the nation have been in Launceston for the last five days at Students of Sustainability conference. In it’s twenty-second year, SOS is an environmental conference for students. 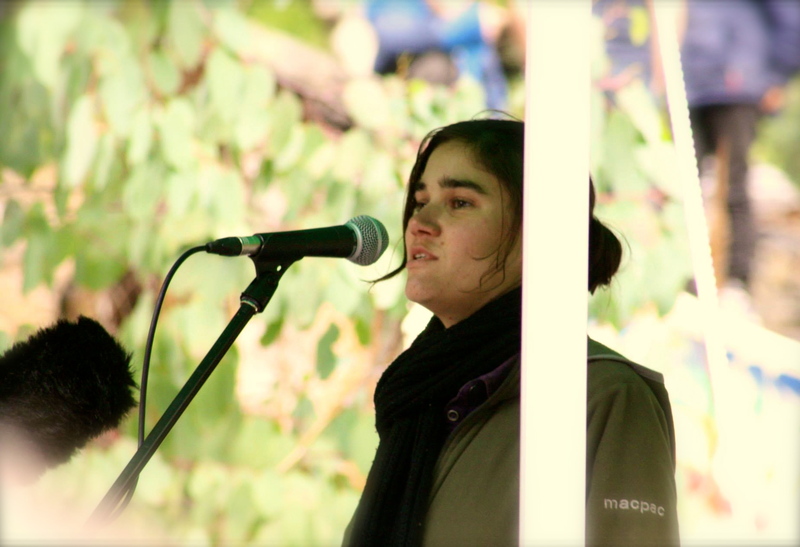 Tasmanian forest campaigners held workshops and discussions at the conference. Over 30 students have joined with Tasmanian forest campaigners to take part in today’s action and are committed to continuing action to stand up for our native forests” Miranda Gibson said. 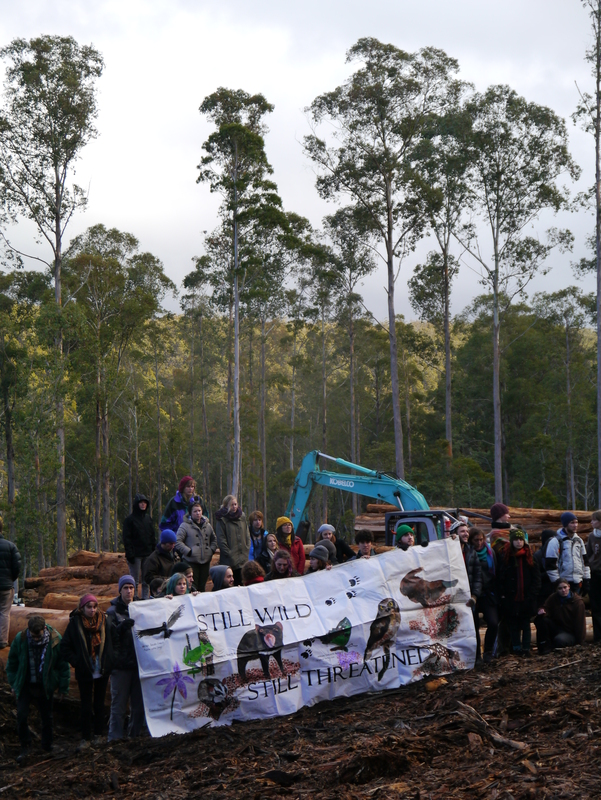 “Australian Student Environment Network is standing in solidarity with Huon Valley Environment Centre and Still Wild Still Threatened in an ongoing campaign to defend Tasmania’s native forests,” said Ms Gibson. Media Release: The world celebrates the success of community action to protect forests. The decision today by the World Heritage Committee to approve the extension to the Tasmanian Wilderness World Heritage Area is testament to the power of the community, after decades of action to defend these forests. The Observer Tree and the forest surrounding it as well as the site of Camp Florentine blockade are now World Heritage listed. “On December 14th 2011 I climbed to the top of a tree in a threatened forest and said I would stay until the forest was protected. That forest is now World Heritage. It is thanks to the support from people right around the world that the forest is still standing and is now protected” said Miranda Gibson, spokesperson for Still Wild Still Threatened. “For 14 months I watched over the forest every day with the hope that we, as a community, could defend those trees for future generations. Today, for that forest, we have achieved that” said Ms Gibson. “Today I think of the wedge tailed eagle that I watched fly above my tree, whose habitat was once under threat and is now protected and of the Tasmanian devils who lived in the forest 60 meters below my platform who can now raise their young in peace” said Ms Gibson. “Today we celebrate the protection of some of Tasmania’s most significant forests including the Tyenna, Weld and Upper Florentine. 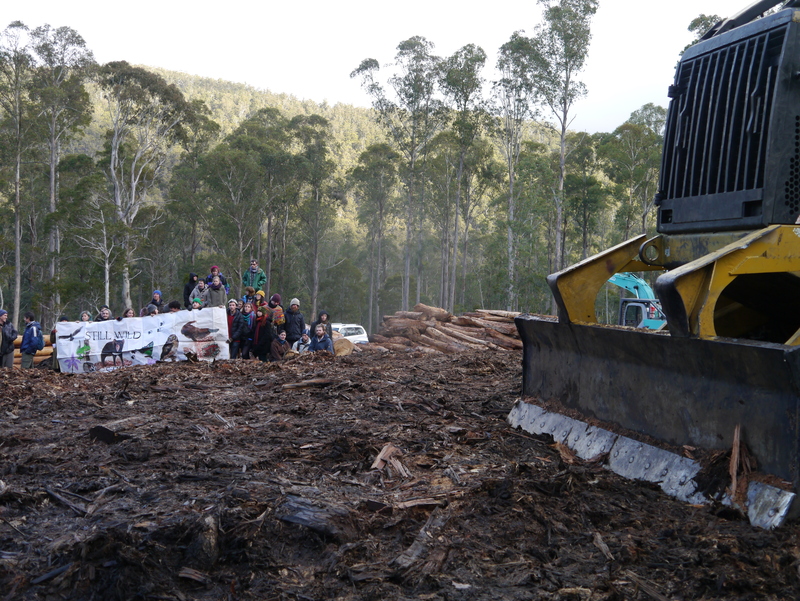 For six years the Upper Florentine Valley has been defended by Tasmania’s longest running forest blockade. This forest is still standing because the community took action and halted logging to protect the values of this ecosystem, that are now officially World Heritage. This Sunday the community will return to site of Camp Florentine to celebrate our success in ensuring these forests will be standing for future generations” said Ms Gibson. 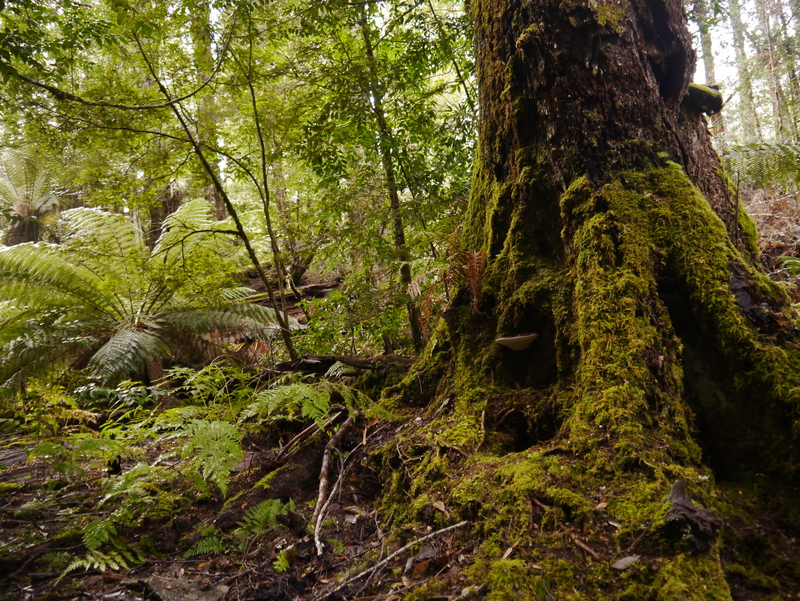 “Thousands of people across the globe have been part of this global movement to protect Tasmania’s ancient forests as World Heritage. Right around the world people today are celebrating the power of community action and what we have achieved for Tasmania’s forests said Ms Gibson.